Actor Harrison Ford has been seriously injured after a World War II-era training plane he was piloting crashed into a golf course in Los Angeles. Ford reportedly sustained injuries to his head as a result of the crash, though he survived and is now being treated at a hospital. The 72-year-old actor is in stable condition, with NBC News reporting he suffered from cuts to the head and possible fractures. Other reports suggested he had gashes on his head and was bleeding. However, CNN stated that Ford's condition is still unknown and that he suffered "moderate trauma" when he crashed. It's also unclear if Ford was attempting to land at the time, but the network added that his plane reportedly hit a tree on the way down. Officials said he was conscious when taken from the scene of the crash. "We are very thankful that the passenger had [only] very moderate injuries," Los Angeles Assistant Fire Chief Patrick Butler said, as quoted by NBC Los Angeles. The LA Fire Department confirmed that Ford was the only individual in the single-engine plane, and no other injuries have been reported. Howard Tabe, who was at the golf course when the plane crashed, told NBC that two doctors who were also at the scene rushed to treat the actor when the incident occurred. Tabe also said Ford had blood on his face. In a tweet, Ford's son Ben said that his father was "battered, but ok."
Ford is an experienced pilot who has been flying since the 1960s. 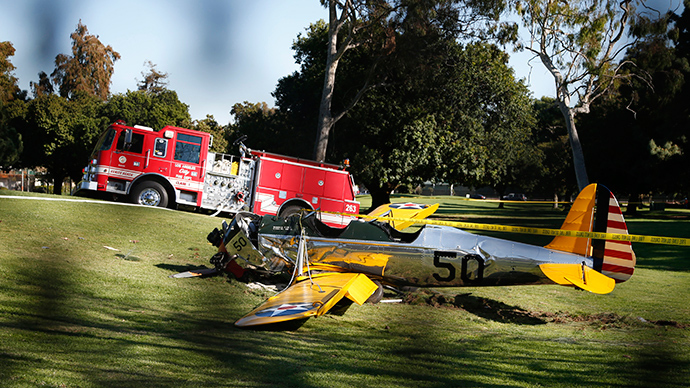 This isn't the first time the famed 'Star Wars' and 'Indiana Jones' actor has crashed, either. In a 2008 interview with National Geographic, he described an incident that took place as he was flying a helicopter. "Well, there was a mechanical failure while we were practicing power recovery autorotations. It was more or less a hard landing," he said at the time. "Luckily, I was with another aviation professional and neither of us was hurt—and both of us are still flying." Back in 2000, Ford was involved in another crash as well, this time in a six-passenger aircraft that was occupied by him and one other person. The plane was damaged, but no injuries were reported.